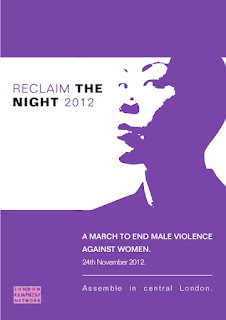 Join us in 2012 for the 9th revived London Reclaim the Night march. Marches are always held on the nearest Saturday to the 25th November to mark the UN Day to End Violence Against Women. All women are welcome at Reclaim the Night, including: women of all colours and cultures, of all religions or none, women of any age, disabled and non-disabled women, heterosexual women, lesbians, trans women, bisexual women, refugee and asylum-seeking women and any other women you can think of! We would love to see you all there. Bring along your mothers, grandmothers, sisters, aunts, nieces, and daughters.